The following pages describe a variation on the Everest Base Camp trek from Lukla. 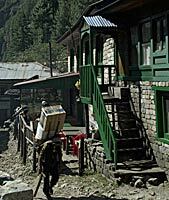 Instead of going 'straight up' to Gorak Shep and Everest Base Camp and returning via more or less the same route we first turn off towards the West and Gokyo Lakes then cross over the Cho La pass to enter the Khumbu valley. 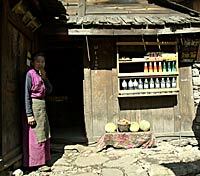 The Khumbu region is possibly the most popular trekking region of Nepal (and the Himalayas) but it is not a walk in the park, especially the crossing of the Cho La which is not really a trekking pass and might need mountaineering experience and equipment if the conditions are any less than ideal. As in the other treks described on this site, I have relied more on photos than text to give a feeling of the trek. You might note some discrepencies at times with one photo of an area showing, for example, snow where the next picture doesn't have any. This is simply because I did this 3 weeks circuit twice (the first in October, the second in November) and of course the day to day weather conditions varied. The quick way into the Khumbu region now used by 99% of the visitors to the area is to fly from Kathmandu to Lukla. The flight only takes about 40 minutes but it can be frequently delayed or cancelled because of fog at departure (not uncommon in the Kathmandu valley but it generally clears later in the day) or fog / clouds and general poor visibility at Lukla. When you see the short runway (which is now tarmacked so it's a big improvement) you will understand that there has to be good visibility to safely land and take off. It is not always the case and people willing to travel by plane to these regions must take delays into account. On days where the flying is OK you can get lots of flights arriving and departing in short succession. It seems chaotic but really runs like clockwork. This is especially the case if there is a backlog of stranded travelers to clear when the weather condtions turn good again. These planes can only carry around 20 passengers so you need lots of them (there are several companies now flying in Nepal) to transport several hundreds of trekkers (in peak season with flights cancelled for several days it can be even more than this). After arriving at Lukla, collecting your gear and meeting your sherpas porter loads haveto be allocated and this generally takes a bit of time as well but most people still chose to start walking towards Namche, stopping on the way for the night. We walked the easy (and busy) trail to Pakding, about 3 hours walk from Lukla. This is a longer walk and the first serious ascent of the trek. Going well above 3000m without acclimatation you can really feel the lack of oxygen slowing you down. The path to Namche is also very busy because Namche Bazar is the capital of the Khumbu region and there is a lot of suppplies being carried up by porters and dzos (a cross between a cow and a yak which is often used as pack animal at medium altitudes - yaks take over higher up). The crowded trail can make it a little difficult at times to find a correct walking pace (as if the altitude factor wasn't hard enough!). 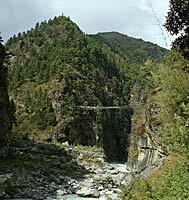 The first few hours you follow the valley of the Dudh Kosi (the Milk River) crossing the river a few times on good suspension bridges. They can still be a little daunting if it is your first time crossing on such a bridge. Avoid timing it with pack animals crossing in the order direction because you will feel very uncomfortable indeed. These packed beasts are wide! Between Monjo and Jhorsale you enter the check point of the Sagarmatha National Park, one of the 162 Natural World Heritage Sites (in 2006). It is interesting to go and have a look into the room next to office of the main building where visitors figures have been listed (photo on the right). Once in the National Park and after two more river crossings the ascent to Namche starts. You can see one more bridge perched high up above the river (which separates into two branches near this point). That particular bridge tends to give people a little more problems (it's a lot higher above the valley floor and maybe a little less solid looking). Shortly after the last bridge crossing and if the weather is clear you will get your first glimpses of the South face of Everest in the distance. It is not far to Namche but it feels endless as you are starting to struggle with the effect of altitude (of course if you are already acclimatized it's just a pleasant walk up in the forest. Talking about forest reminds me of an interesting fact about the region: since the National Park was created (with a lot of rules about use of wood and cutting trees) the forest has increased quite substantially. God news for Khumbu.